Evidence from the scene has been handed over to gardaí. HOUSES IN CARBURY, Co Kildare were evacuated this evening due to the presence of two viable Improvised Explosive Devices (IEDs). 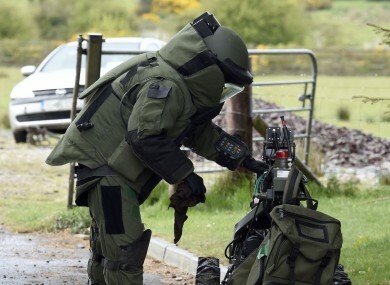 The Defence Forces deployed the Army Bomb Disposal Team following a request from An Garda Síochána. A cordon was established in the surrounding area and a number of houses were evacuated to ensure public safety. The bomb disposal team arrived at 6.30pm and made the suspect devices safe. The scene was declared safe at 7.50pm. Evidence from the scene was handed over to gardaí. Email “Houses evacuated in Kildare as army make two viable devices safe”. Feedback on “Houses evacuated in Kildare as army make two viable devices safe”.